It had been a glorious two months for Stefanie Graf. On June 6, 1999, she had won the singles title at Roland Garros, her first major in more than two years. Eight days later she’d turned 30 and gone on to reach the finals at Wimbledon. On August 1, she’d gone on her first date with the man who’d won the men’s singles title in Paris, Andre Agassi. Now it was August 3, Graf entered in WTA tournament in the San Diego area. Her opponent was a hard-hitting veteran, Amy Frazier. Graf had won all six of their previous matches and began this one by taking the first set 6-4. Frazier won the second, 7-5 and led 2-1 in the third when Graf retired from the match with a thigh injury. No one knew at the time, but it would prove to be Graf’s final match. Ten days later came the announcement. 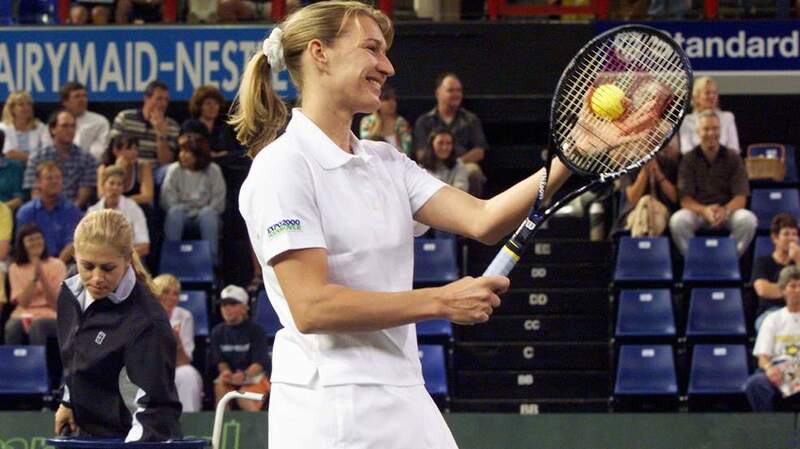 “I thought long and hard after Wimbledon about where I wanted to go and what I wanted to do with my tennis,” Graf said, “and for the first time in my career, I didn’t feel like going to a tournament.” As fate had it, Graf joined a group of other illustrious athletes who retired that year – hockey star Wayne Gretzky, football great John Elway, basketball’s Michael Jordan. Her legacy would be massive – 22 Grand Slam singles titles, including the calendar year “Golden Slam” in 1988 that included an Olympic gold medal. And with that, she snapped and exited.